In stock -This product will ship today if ordered within the next 11 hours and 12 minutes. 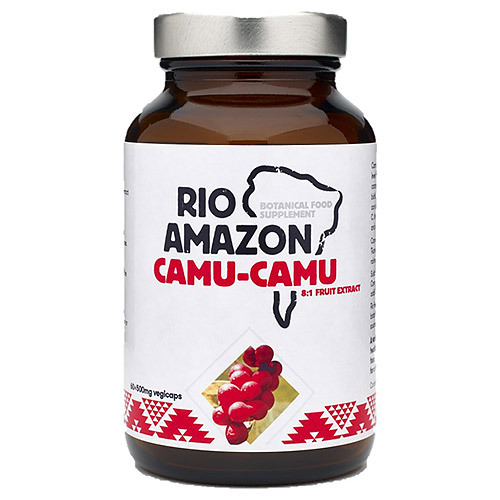 RIO AMAZON Camu-Camu 8:1 Extract contains a high level of vitamin C. It also provides iron, carotenoids, vitamins B2, B3, bioflavonoids and other nutrients that can aid in the absorption of the vitamin C. It is non-citrus, gentle on the stomach and easy to digest. Camu-Camu fruit (also known as Rumberry) are native to the Amazon Rainforest in South America. Camu-Camu (Myrciaria Dubia) 8:1 extract, Maltodextrin. Capsule shell: vegetable cellulose. Take 2 vegicaps before food. Do not exceed the maximum recommended dosage. A varied, balanced diet and a healthy lifestyle are important. A food supplement is not a substitute for a varied diet. Below are reviews of RIO AMAZON Camu-Camu - Vitamin C - 60 x 500mg Vegicaps by bodykind customers. If you have tried this product we'd love to hear what you think so please leave a review. 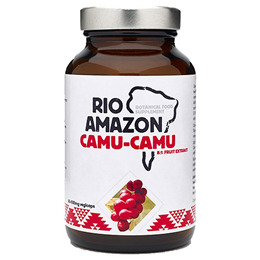 RIO AMAZON Camu-Camu 8:1 Extract contains a high level of vitamin C. It also provides iron, carotenoids, vitamins B2, B3 and other nutrients that can aid in the absorption of the vitamin C. It is gentle on the stomach and easy to digest.